Regents' choice: UT Arlington faculty members honored with the UT System Regents Outstanding Teaching Awards are, from left at top, Dr. Shih-Ho “Simon” Chao, Dr. Raymond Elliott, Deborah Hughes; at bottom, Dr. Judy LeFlore, Dr. Sanjiv Sabherwal, and Dr. Jeffrey Witzel. 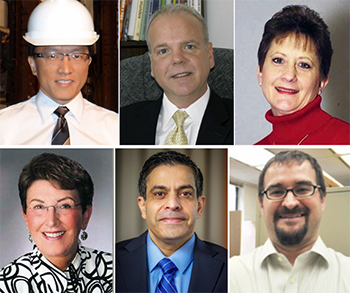 Six UTA faculty members are among The University of Texas System educators honored with 2015 Regents' Outstanding Teaching Awards for excellence in the classroom. The UT System professors will share $1.9 million in awards and will be honored during a special ceremony in August by the Board of Regents. Read more about the Regents' Outstanding Teaching Awards. At top, Brenda S. McClurkin, archivist for Special Collections and Archives, works in the new cold storage vault in the Central Library's basement. Operational testing runs for about six months before its 950 square feet are filled with negatives. The vault will maintain a temperature of 38 degrees Fahrenheit with 30 percent relative humidity, which can extend the life of the negatives by approximately 500 years. At bottom is an example of damage to a negative as a result of heat and humidity over time. 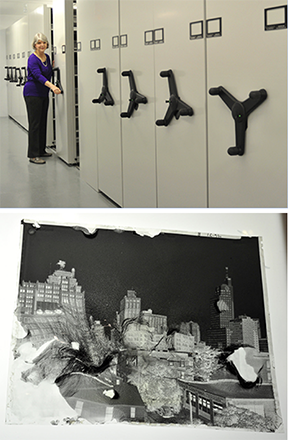 Read more about the library cold storage. Be part of the 50-year celebration of the Arlington 4th of July Parade by riding on or walking with UT Arlington's two floats. The parade starts at 9 a.m. Saturday, July 4. UTA will be the 34th feature of the parade's 159 entries. Join President Vistasp Karbhari and his wife, Lisa, on the first float. UT Arlington Band members will ride on the second float, followed by several Formula SAE cars. Wear UT Arlington apparel in Maverick colors of orange and/or blue. For hats, wear one with a UTA logo or a generic design. And, of course, wear comfortable walking shoes. Arrive at the UTA float in lot 49 at 7:30-8 a.m. the day of the parade. Parade participants can park in lot 50, south of the staging area in lot 49 at Cooper Street and Doug Russell Road. Other options include parking elsewhere on campus. A shuttle from Maverick Stadium to lot 49 starts at 6:30 a.m. and returns to the stadium after the parade. See the Arlington 4th of July Parade website for details on the parade route, street closures, and more. The College Park District parking garages and surrounding parking lots will be used for the city of Arlington's annual Independence Day celebrations. Access to the garages and nearby lots will be limited beginning at 6 p.m. Thursday, July 3, for the Light Up Arlington fireworks show and at 6 a.m. Friday, July 4, for the Arlington 4th of July Parade. Lot 49 will be closed to non-parade vehicles beginning at midnight, Thursday, July 3, until the end of the parade. The UT Arlington Libraries will be closed Saturday, July 4, in observance of the Independence Day holiday. The swimming pools at the Maverick Activities Center and the Physical Education Building will be closed Saturday-Sunday, July 4-5. The MAC is closed on Saturdays during the summer. Yahoo! 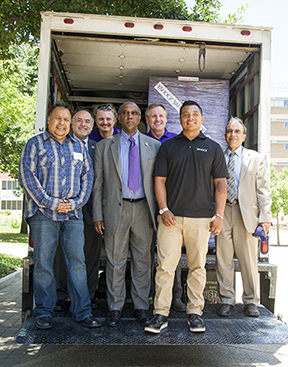 Labs delivered 480 computer servers in its signature big purple truck Wednesday. Mechanical engineering Professor Dereje Agonafer will use the computers in the Electronics, MEMS, and Nanoelectronics Systems Packaging Center, which focuses on how to more effectively cool data centers. The research is part of an Industry/University Cooperative Research Center in Energy-Efficient Electronic Systems whose members include UT Arlington, Binghamton University, Villanova University, and Georgia Institute of Technology. On hand to help unload were, from left, Larry Ocana of Yahoo! ; Dr. Khosrow Behbehani, dean of the College of Engineering; Chris Stringer of Yahoo! ; Dr. Agonafer; Don McGillen, head of Academic Relations for Yahoo! Labs; Donald Sanchez of Yahoo! ; and Dr. Erian Armanios, chair of the Mechanical and Aerospace Engineering Department. Amigos Library Services has awarded UT Arlington Libraries $6,000 to create a digital audio studio opening this fall. The Digital Audio Experience Studio will provide performing arts technologies for recording and mixing music and audio to all students, regardless of major or classification. Proposed equipment includes musical keyboards, microphones, vocal headphone microphones, and computers. Read more about the Digital Audio Studio Experience. Changes in parking permits and regulations begin Saturday, Aug. 1. Student parking permits will be $165 per year. A daily permit will be $7.50, and the hourly meter rate set at $2.50. Weekly and monthly permits will be discontinued. Parking meters will be enforced 7 a.m.-11 p.m. Mondays-Saturdays. Read more about the 2015-16 parking permits and regulations. Need some suggestions for your summer reading? An informal poll of College of Liberal Arts faculty and staff resulted in several fiction and nonfiction selections. See the summer reading list with titles favored by faculty members Stacy Alaimo and Bruce Krajewski of English; Elisabeth Cawthon and Marvin Dulaney of history; Chris Conway of modern languages; Rebecca Deen, Brent Sasley, and Allan Saxe of political science; Laurel Stvan of linguistics and TESOL; and COLA staff members James Dunning and Ami Keller. 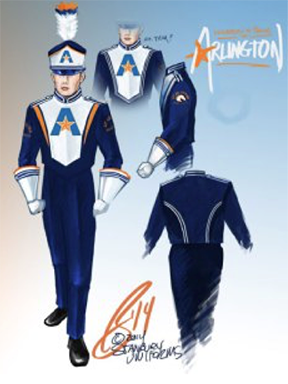 The UT Arlington Marching Band will have a fresh look this fall after 13 years. The new uniforms feature navy pants and white jackets with orange accents and the UTA logo prominently displayed. “These new uniforms look like UTA,” says John Zastoupil, marching band director. “When we go to shows in the fall, it will be obvious we are from UTA. It’s a recruiting tool and it’s important the branding piece is in place.” The uniforms will debut Oct. 6 during Dean Corey Night, an Arlington ISD event at Maverick Stadium. Read more about the UTA Marching Band, the new uniforms, and fall performances. The city of Arlington has renewed the contract for the Metro Arlington Xpress (The MAX) bus service for one year. The MAX offers bus service 5:30 a.m.-11:30 p.m. Monday-Friday from three stops in Arlington to the CentrePoint Station of the Trinity Railway Express. The bus stop by UTA is at Center and Border streets by the College Park District garages. Tickets are $5 per day with discounts for UTA students. Service is provided by the Fort Worth Transportation Authority and the Dallas Area Rapid Transit. Read more about The MAX at ridethemax.com. Last day to drop classes for summer 14-week term. First day of classes for summer II term. Late registration for summer II term. Census date for summer II term. Final grades posted for summer I term. Last day to drop classes for summer 11-week term. Final grades for the summer I term are scheduled to be available after noon Monday, July 20. View grades by logging in to MyMav. Light Up Arlington Live music, food trucks, train rides, caricature artist, petting zoo, temporary tattoos, face painting, and fireworks. Free, but some activities require a fee. 6-10:30 p.m., downtown Arlington. Light Up Arlington. Free Outdoor Movie: 'Furious Seven' Bring a chair or a blanket, a picnic, and friends for outdoor movies each Thursday. Free popcorn. The next movie is The Breakfast Club (1985), July 16. Free. 9 p.m., lawn behind the Maverick Activities Center. EXCEL Campus Activities. Discount Rangers Tickets Texas Rangers vs. Los Angeles Angels. Visit texasrangers.com/grouptickets, click on University of Texas at Arlington, and use the password GOMAVS to get your discounted tickets. Various times, Globe Life Park. Upcoming games are Arizona Diamondbacks, July 7-8; San Diego Padres, July 10-12; and New York Yankees, July 27-30. Arlington Technology Association Shih-Ho "Simon" Chao, civil engineering associate professor, provides a brief history of concrete, describes factors contributing to its strengths and weaknesses, and reviews recent developments in improved concrete composites. Light breakfast provided. RSVP. Free. 7-8 a.m., Room 100, Nedderman Hall. Arlington Technology Association. Safe Zone Ally Training Learn how to be supportive to lesbian, gay, bisexual, transgender, questioning, and other sexuality and gender identity community members. Register by noon Monday, July 13. Free. 1-4 p.m., Red River/Concho Rooms, E.H. Hereford University Center. LGBTQA Program. Triple play: Chineme Obikudu earned a spot on the U.S. 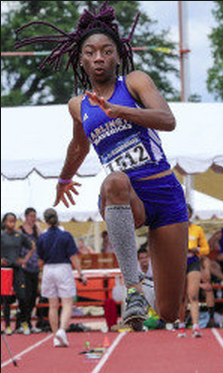 Junior National Team when she won the women’s triple jump at the USA Junior Track and Field Championships in Eugene, Ore. Rising sophomore Chineme Obikudu won the women’s triple jump Saturday at the USA Junior Track and Field Championships in Eugene, Ore., to earn a spot on the U.S. Junior National Team. She smashed her personal record by 13 inches on her way to winning the competition by nine inches. She posted the winning mark of 42 feet, 7 inches on her fifth of six jumps. Obikudu is the second Maverick to win a USA junior title and qualify for the Junior National Team, joining Lisa Austin. Quentin Butler, who completed his UTA track career earlier this month, qualified for the semifinals of the 100-meter dash last week at the USA Track and Field Outdoor Championships in Eugene, Ore. He ran a personal-best time of 9.96 at the same Hayward Field track that he competed on at the NCAA Championships. Butler failed to advance to the finals of the event. Movin' Mavs athletes recorded wins at two competitions recently. Ricardo Lucien won the B singles title at the Air Capital Wheelchair Tennis invitational in Wichita, Kan. In the C division, Austan Pierce and John Watson claimed the doubles title while Watson took home second place in singles. Daniel Velasquez brought home a silver medal in the 100-meter mixed class division at the U.S. Paralympic National Championships in Minneapolis, Minn.
• Golf coach Stuart Deane captured the E-Z-Go Eastern Championship on June 16 at the Dallas Athletic Club. He is competing this week in the 48th PGA Professional National Championship at the Philadelphia Cricket Club. • Women’s basketball head coach Krista Gerlich has promoted Kristin Cole to associate head coach. Cole has been with the Mavericks for two seasons and helped the team win 17 games in 2014-15. • The women’s basketball team will tip off its 2015-16 season against two-time NCAA national champion Baylor in the first round of the Preseason WNIT. The Mavericks and Bears will play Friday, Nov. 13, in Waco. The deadlines for individual sports are badminton, July 14; poker, July 23; and MavStrong competition, Aug. 6.